Total non-duplicated direct educational contacts documented through the Arkansas Information Management System (AIMS), digital analytics and the Zoom registration system for the duration of this project totaled 40,093 (not including on-farm research contacts with cooperating farmers). Engagement data for direct educational contacts was collected for a range of outreach and education methods/platforms with the target audience, including: Blog Visits= 2,818 Constant Contact (Direct Contacts) = 34,965 Facebook (Direct-2018*)=1355 Twitter (Direct-2018*)=470 VFT Video Views = 456 VFT Participants = 279 TOTAL Direct Education and Outreach Contacts = 40,093** *Direct contacts for Facebook and Twitter collected for 2018 only **Does not include indirect digital contacts (reach), print media reach, or outreach contacts accomplished through partner organization posts Total indirect outreach and education contacts for this project was compiled utilizing verifiable digital analytics collected through-out this project. Data reflecting secondary audience reach facilitated through re-purposed communication products posted by project partners was not estimated and recorded due to a desire for accurate measurement. This project recorded 105,730 total in-direct educational contacts, which included: Facebook (43,594), Twitter (27,171) and Constant Contact (34,965). It must be noted that participant data for the Virtual Field Trip (VFT) is under-reported. The Zoom VFT event online registration form only required that one individual register by location (to receive the broadcast link). During the broadcast it came to our attention that some registered sites had multiple participants, with one site hosting a watch party with photo verification of between 15-20 broadcast participants. Demographic data was collected on all “registered” participants as well as “actual” participants that logged in and participated live the day of the broadcast. Registration records reflected that 464 individuals registered from US and international locations. Participant data included 239 participants. Participants were not required to submit all participant demographic data for access to the webinar, but most provided this data at time of registration. Participant data was aggregated based on the aggregation of persons who actually logged in and participated in the broadcast. 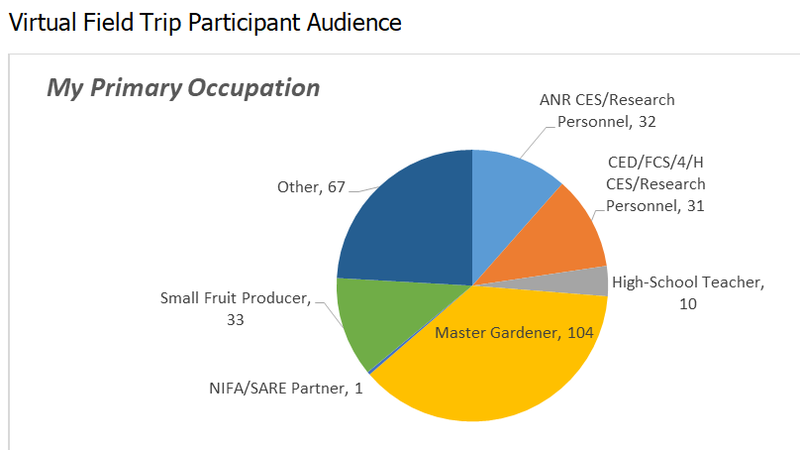 The VFT Target Audience identified in the project proposal included: State and national small fruit producers, agriculture researchers/CES agents, federal partners, land owners and international fruit producers.